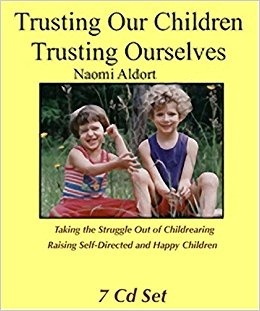 This comprehensive, indispensable 7 CD set contains six keynotes given by Naomi Aldort at the unschooling/homeschooling conference, Rethinking Education in Dallas, Texas. It covers practically all the major parenting and self-directed learning issues in one amazing package. Disc 1) Rethinking Education: Debunking common assumptions about child development. Disc 2, CD 1) Raising Our Children, Raising Ourselves Part I: Bring peace and unconditional love into your relationship with your children by understanding your own reaction as different from your child's needs. Disc 2, CD 2) Raising Our Children, Raising Ourselves Part II. Disc 3) Debunking Praise: Find out why you really praise and at what price. Disc 4) Children's Behavior and Emotions: Includes many questions from audience members, and Aldort's skillful guidance about understanding children so they can be the best of themselves. Disc 5) Self Directed Learning: Why children learn best when they follow their own path, timetable and direction, and how to support them toward their own fulfillment. Disc 6) Equality, Respect and Freedom for Children: From chores to bed time and dinner; how to live with children in a way that they care and respond, not out of fear, but out of joy and love, of their own free will.